Dry and/or scaly skin is the sign of essential fatty acid deficiency. The skin’s outermost layer is composed of cell membranes and protein, and the cell membranes are dependent on good fats. A healthy child has lustrous skin and hair. Hair is really an appendage of the skin, made of protein derived from cell membranes. Many children today have dull hair and dry skin; actually, varying degrees of dryness are the rule, from a flat dullness to visible scaling and roughness. Healthy food fats are the best way to ensure that your child gets the balanced essential fatty acids that they need, and these are walnuts, raw nuts and seeds, fresh fish (salmon, tuna, mackerel, sardines), avocado, and navy and kidney beans. Clearly it is a problem for parents to ensure their children receive an adequate intake, particularly a fussy eater, therefore food oils are the most practical way to supply EFAs to their children. These are fish oil extracts, black currant oil and borage oil (unique in containing gamma linoleic acid or GLA, helpful during metabolism of linoleic acid), cod liver oil (never use defatted cod liver oil, but may purchase the flavored oil). Children with eczema may have difficulty converting linoleic acid, the major omega-6 EFA, to GLA, and borage and black currant oils get around this problem. While we are looking at skin health here, parents will discover that learning disabilities may improve, and behavior problems may lessen when their child is no longer deficient in essential fats. 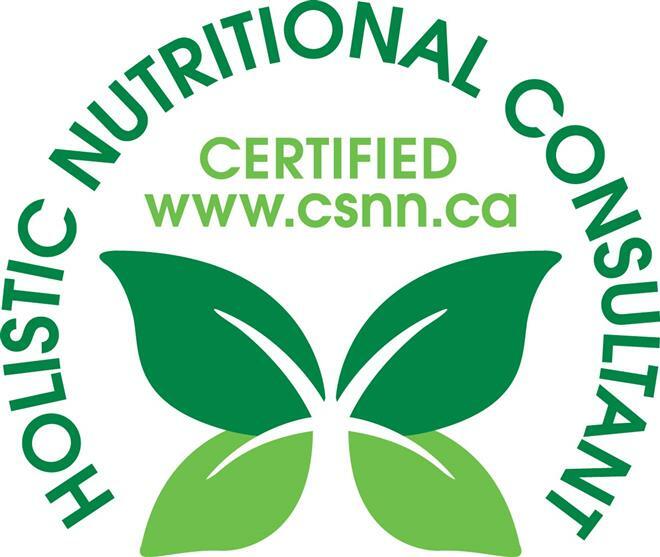 Some sources say that 80% of hyperactive children benefit from EFAs. If your child suffers from autoimmune disorders, asthma, and many other illnesses, you may see lessening of symptoms over time. It is useful to open a capsule and add it to smoothies or other foods for children that are unable to swallow capsules, and rubbing the oil from the capsule on the skin is most helpful as well. (do not give capsules to children under the age of 4). In addition to the borage oil for GLA content, use pure oils rather than lotions that contain many undesirable additives, such as pure jojoba oil, pure avocado oil, pure walnut oil and pure hemp oil , even olive oil, as good sources for rubbing on a baby’s, or children’s skin. Seeing healthy skin and hair on a child means the essential fats are being assimilated, and this is helping the child to build resistance to disease. Because Vitamin A is a co-factor nutrient, helping the enzymes in your child’s body metabolize EFAs, it is crucial to healthy skin. The best sources of vitamin A are orange, red, yellow, and deep green vegetables, for example carrots, squash, sweet potatoes, pumpkin, tomato, spinach, watermelon, mango, and apricots. Good animal sources are the egg yolks from pasture raised chickens, and cod liver oil. As the cell membranes are composed of protein as well, it is important to ensure your child has small amounts of good quality protein, spread over the day. Avoid processed proteins, as well as all processed foods; many are full of undesirable additives and sugars. Many children love pasta; purchase pastas such as chickpea rotini, quinoa swirls, lentil pasta, black bean spaghetti, and other whole food pastas rather than the usual pasta made from white wheat flour. Salads made by combining the bean pasta with the grain pasta give the child a good source of protein. Another way to increase the nutrient value of pasta sauces is to add some vegetable powders such as dehydrated beets, tomatoes, and onions, as well as a good quality (high level of amino acids) collagen powder. Spend time with your children planning menus, recipes, and shopping together for the ingredients. Allow them to help in the preparation of the foods, encouraging interest and desire to eat what they have made. A huge thank you to all you attended the Heart Health workshop on Saturday March 23rd. I appreciated discussion and questions regarding the material presented. We always have an interesting and inquiring group of people, and it was encouraging to see men attending and supporting their health and their partners. We had a lot of food, and some fun with preparation! The pasta and legume salad was a hit, so I’ve included the recipe here. The Beet and Cucumber Salad is in Eat Away Illness, and the Cashew Cheese Loaf, Jack Cheese, and Dahl are in Cook Your Way to Health. 2 T. toasted sesame seeds. Variation: use 1 cup cooked white beans instead of chickpea rotini, and add with step 3. Cook chickpea rotini for 9 minutes, rinse, and drain and set aside. Cook quinoa spirals with chopped carrots until el dente, approximately 5 minutes. Add chopped greens (and beans if using) and return to boil, remove from heat and drain. Add green onions and chickpea rotini and combine. Make dressing and combine with salad. Sprinkle with sesame seeds and serve warm or room temperature. Note: Today I heard that one participant made this salad with lentils instead of the rotini. Any legume will enhance the amino acid balance of this salad. The picture below is with white beans rather than rotini. 1. Chop veggies, add rest of ingredients and serve. Thank you to my guest, below, who experienced an overnight retreat here last week. I hope to be of service to many more persons who need a diet/lifestyle boost. Thanks to her as well for the testimonial below. “A great experience. Anything to fight the traditional medical pharmaceutical model. Drink in the tranquility; it is peaceful, serene, refreshing, and calm. I had the most amazing sleep. It was a hallelujah moment. Just felt the stress melting away. The food is delicious, nutritious, exquisite, unique. The mentorship of what to buy, where to buy, how to prepare and store the selective foods for healing was so useful. I found the hour long somatic exercise experience enlightening. Education so basic and yet so necessary to our well being. I’ve been experimenting with drying my beautiful Cinderella pumpkins and the results are amazing. 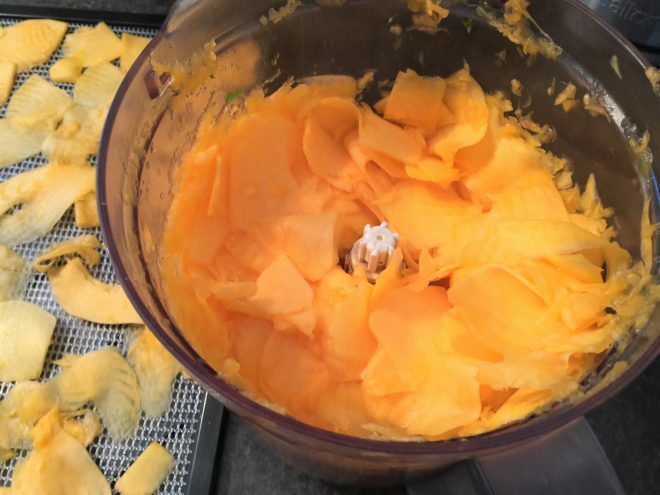 I peeled the pumpkin, and sliced it very thin with my old Braun food processor, and dried it on trays in my dehydrator. I then made a powder in my Nutri Bullet. 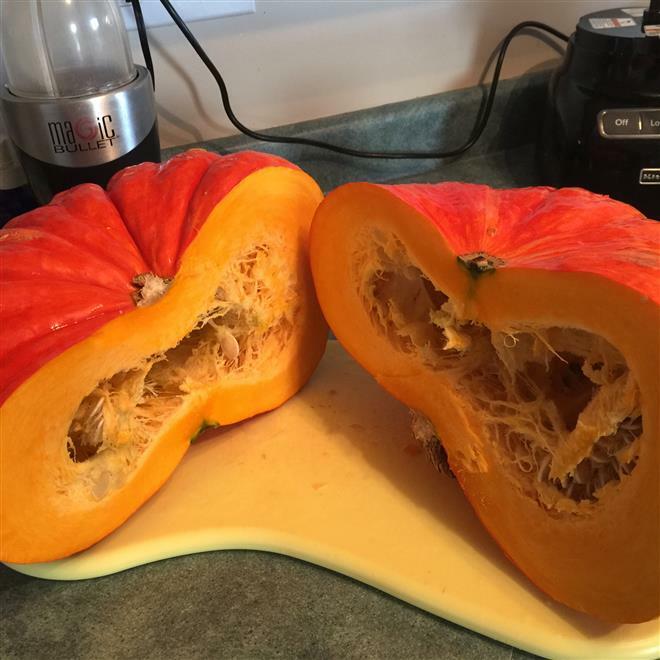 One fairly large pumpkin dehydrates to a concentrated powder form and makes 1 1/2 cups! Now THAT is nutrient dense! 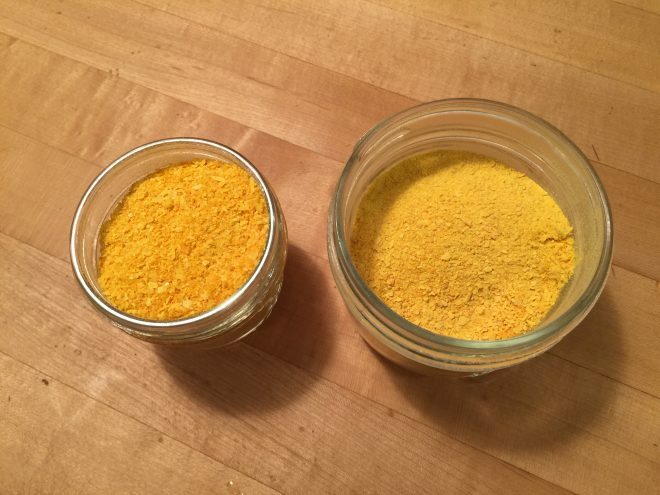 Look at that beautiful orange powder, just waiting to be used when you are in a hurry and want superfood. It stores well on my spice shelf in a closed glass jar. 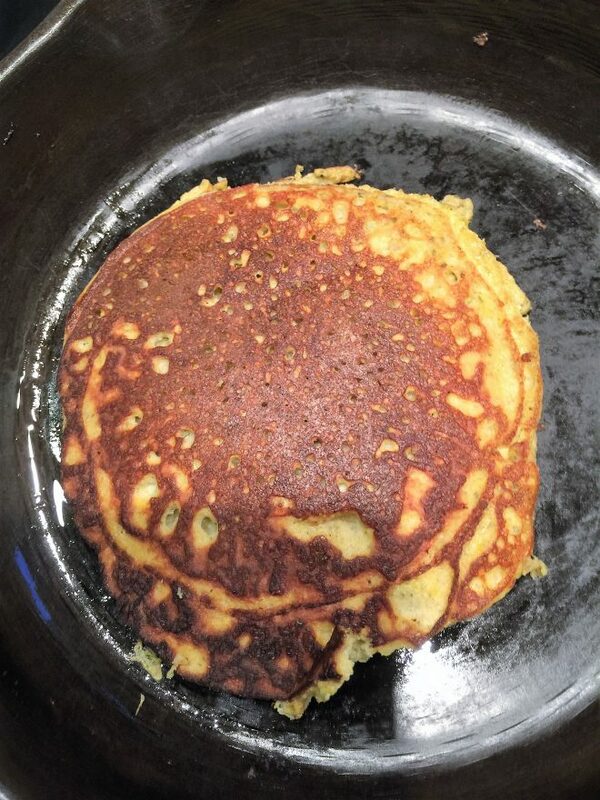 My goal was to use 1 teaspoon in my smoothies, or any blended fruit or vegetable drink for a burst of vitamin A. I decided to try and make my quick Pumpkin Pancakes using the powder, and it worked very well. I love pancakes! 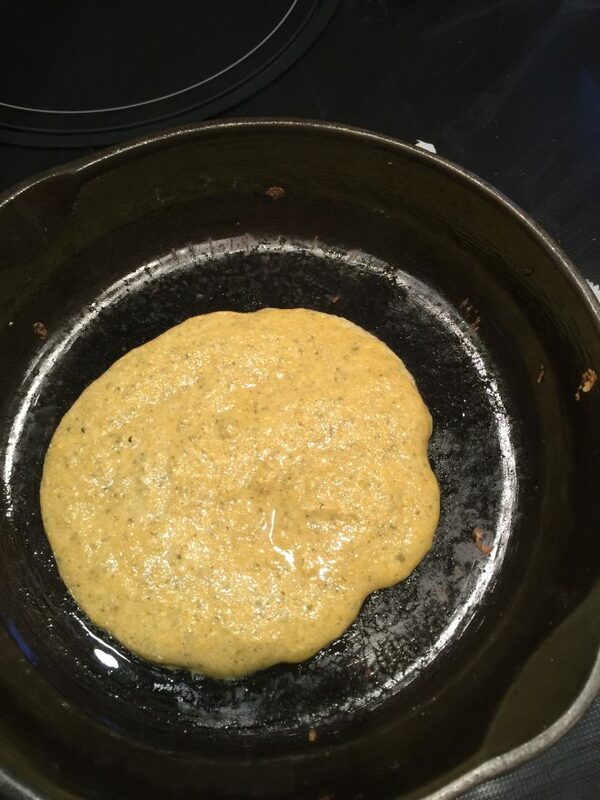 Especially pancakes that are very easy to make, loaded with whole foods, very nutritious, and made without flour. These are so quick and easy to make, and give us that burst of protein so important in the morning. The two eggs provide about 12 grams of protein; the pumpkin seeds are loaded with magnesium and zinc, two essential nutrients for the immune system, as well as great unsaturated fat and fibre. Using organic eggs contribute to getting our vitamins A and D, and contain iositol, choline, and lecithin, all involved in balanced cholesterol metabolism. Researchers believe the lutein in eggs is absorbed immediately, unlike lutein from other sources, due to other components in the egg, such as the lecithin. ( see Will The Real Egg Please Stand Up, What Your Doctor Doesn’t Tell You About Foods, Book 3). 1. To rehydrate the powdered pumpkin, place in a measuring cup and add pure water to the 1/4 line and allow to sit for approximately 10 minutes. 2. Add all ingredients to the Nutri Bullet cup or any blender and puree until no chunks of pumpkin seeds remain. 3. Sauté in a small cast iron pan until slightly brown on both sides. 4. I like to serve these with organic chunky peanut butter and pure maple syrup. Any pancake topping you like will work. Yield: 3 pancakes or 1 serving. (these keep in the fridge for a day or two if you have leftovers). I am going to be busy for awhile dehydrating pumpkins! 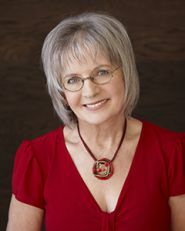 Thank you to all who attended my presentation on Women’s Health at the Farmer’s Market on Sunday, especially the men!!! I promised I would post a list of some of the nutrients important for thyroid health, and the foods that contain them. Iron – red meat, particularly organ meats, nutritional yeast, dark leafy greens, lentils, pumpkin seeds. Iodine – sea vegetables (nori, kelp, and dulse), shrimp, milk, eggs, seafood, navy beans, strawberries. Tyrosine – meat, fish, shellfish, and poultry, eggs, yogurt, pumpkin seeds, avocados. Zinc – oysters, red meat, particularly organ meats, pumpkin seeds. Selenium – brazil nuts, meat, fish, shellfish, and poultry. Vitamin E – sunflower seeds, almonds, dark leafy greens, avocados. Vitamin B2 – dark leafy greens, yogurt, crimini mushrooms, asparagus. Vitamin B3 – chicken, turkey, nutritional yeast. Vitamin B6 – poultry, red meat, particularly organ meats, nutritional yeast. Vitamin C – papaya, bell peppers, broccoli, brussel sprouts, oranges, pineapple. Vitamin D – salmon, milk, egg yolks, mushrooms, THE SUN. Vitamin A (as beta carotene) – sweet potatoes, carrots, dark leafy greens, squash, red peppers. Vitamin A (as retinol) – liver, cod liver oil (fermented is better), egg yolks, butter. Make a list of foods that you like from the above and regularly include them in your meal planning and grocery shopping. They contribute to proper production of thyroid hormones. 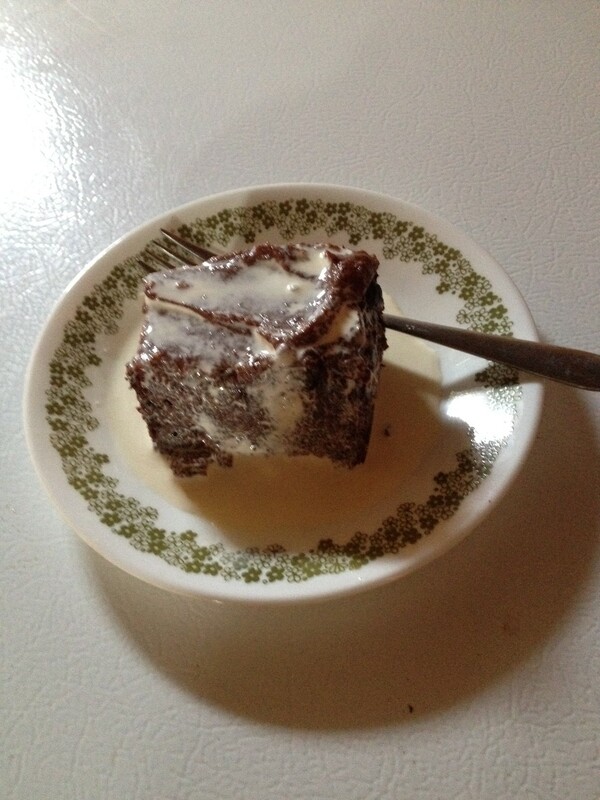 Find recipes that you like to help with changing your regular choices, for example, try the Sweet Potato Brownie in the September 2015 blog post. You are currently browsing the archives for the Information Blogs category.